Our centenary Remembrance activities have taken us outside our doors to invite the Tottenham Court Road community to remember with us. Jonathan Miller and I have spent the midday hours in the international food market at AIC inviting people to participate in our community wreath project and inviting them to our weekend events. Countless strangers have stopped to remember, to buy a poppy, to share precious stories and to pray for peace. There have been moments of deep connection over the cost of war and the bravery of those who served, alongside questions about how to build peace and friendship today. Somehow, people passing by know that a church--our church--is the place to safely raise those tender concerns, even with a stranger on the sidewalk. It has been holy. On Sunday morning, we will be back outside to bear witness on the street again, this time as a whole congregation. Meet us around the corner at the Rangers Memorial on Chenies Street at 10:30 on Sunday morning for a community Act of Remembrance, culminating in two minutes of silence at 11:00. We will be joined by folks from the neighborhood and a bugler from the Rifles. We'll then adjourn directly into our Remembrance Sunday Service back at AIC, probably starting around 11:15. 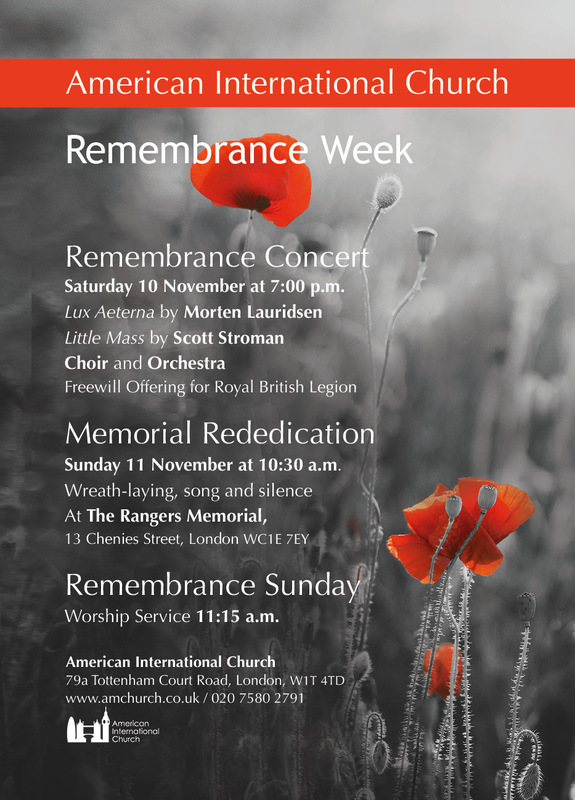 And don't forget Saturday night, too--the AIC Choir will be joined by a volunteer orchestra for a Remembrance Concert in aid of the Royal British Legion at 19:00. Let us come together to remember those who lost their lives in war, and to pray for peace. Maybe some of those folks we met on Tottenham Court Road will decide to come and join us. Join the Choir -- Singers wanted to perform for this special service. Join in rehearsal with the AIC Choir on the next two Wednesdays, 14 and 21 November at 7:00 p.m. Contact Scott at music@amchurch.co.uk for more details. 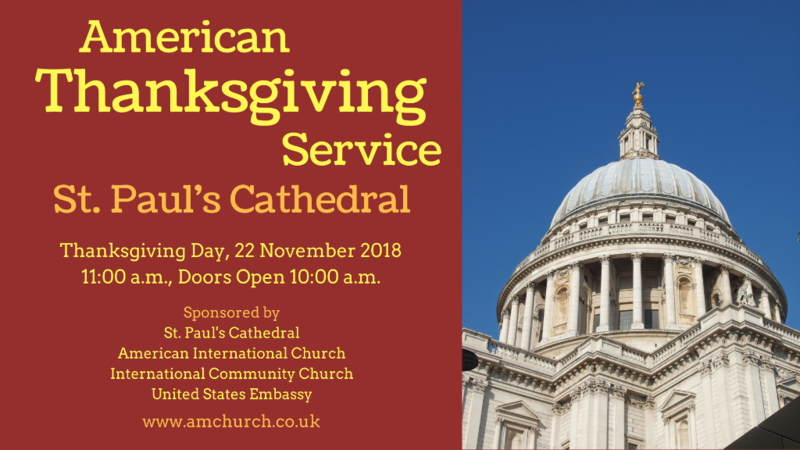 Serve as an Usher -- We need 12 ushers to represent AIC by helping to seat people and collect the offering (which will benefit the Soup Kitchen). 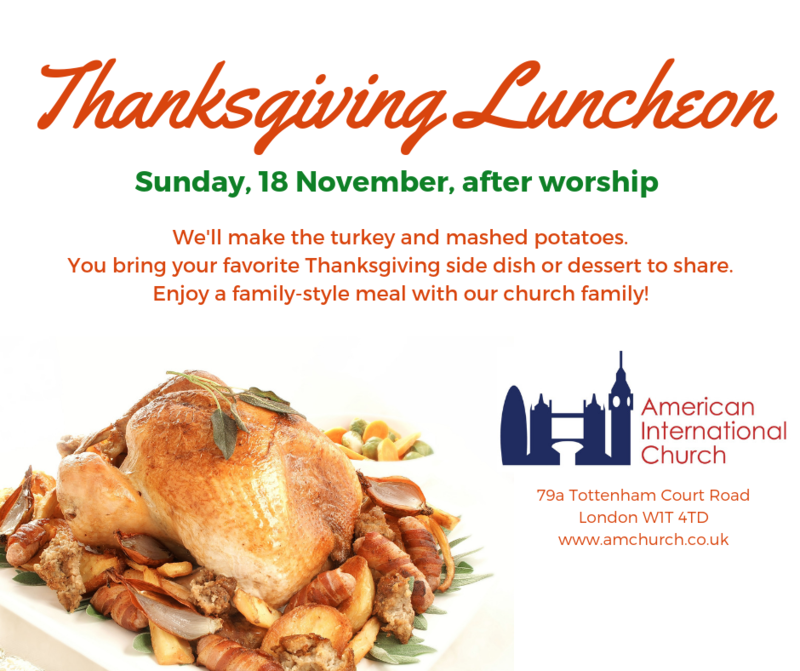 You'll need to arrive by 9:30 on Thanksgiving Day for a brief training, and stay until the service is completed. 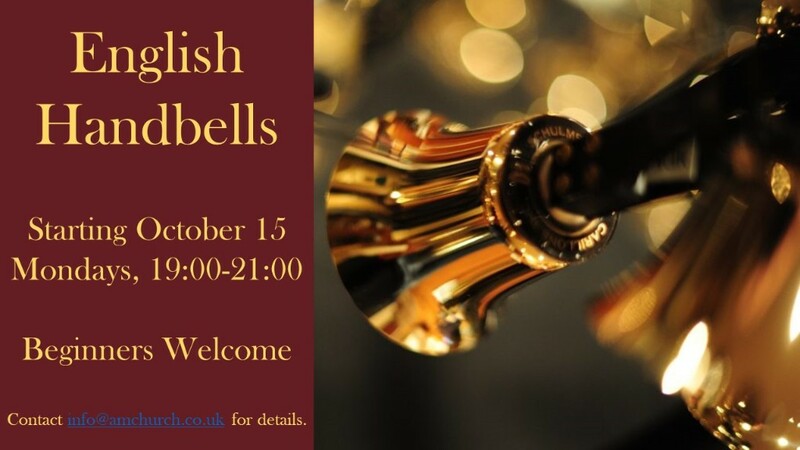 Please e-mail info@amchurch.co.uk to sign up. Reserved Seats -- If you can't sing in the choir or usher, you can still secure a reserved seat near the front by contacting Morgan at info@amchurch.co.uk. You must be seated by 10:45 a.m. for the service, or seats will be filled by the general public.